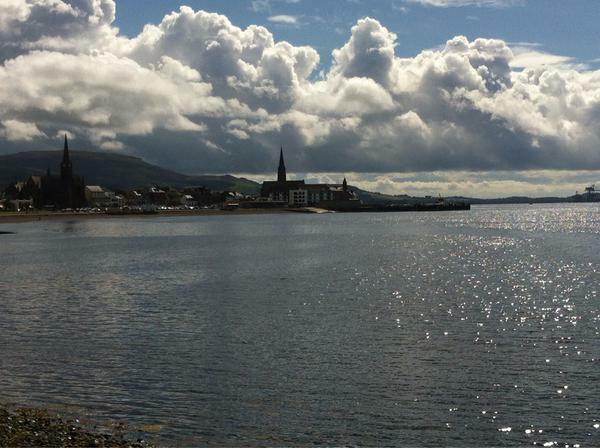 We are very grateful to David Brennan, a Dementia Support Worker from Ayrshire for this powerful blog. Over the years our service has supported many people with a diagnosis of Dementia, now and then we encounter individuals whose cognitive difficulties have greatly affected their ability to communicate. This can (in some cases) result in distress for the services user and their families, distress that could be reduced or even avoided if the individual had a way of being understood by those around them. As a service we welcomed the opportunity to engage in the Talking Mats Training and as a Dementia Support Worker I was eager to have a tool that could help me overcome communication obstacles, having experienced situations where those I support become so frustrated because they desperately want to relay a piece of information, but simply cannot find the words to express themselves. I saw talking Mats as a communication system for those who struggle with speech. However, after using the practice in a practical environment I realise that I have had underestimated its potential, for it has much wider applications in our role. My first experience of using Talking Mats was when producing the video for the second training session. I enlisted the help of a gentleman from the neighbouring Day Care centre. We had never met prior to the session. The Gentleman had no communication difficulties that I was aware of. 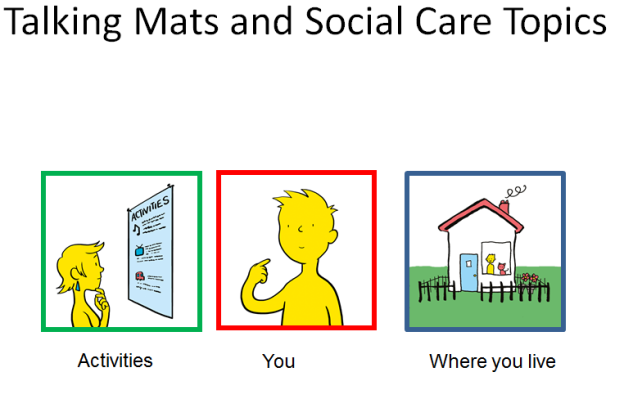 It occurred that Talking Mats also had an effective use in the assessment and quality assurance process that exist within services, providing crucial feedback for continued person-centred planning. Taking this on board I considered examples of service users within my current caseload where the activity could prove beneficial. I have been working with one gentleman for many months. He could be described as a Man’s man, someone who often replies to attempts at conversation with short responses, even when speaking with his wife. He may struggle to remember the names of people and places but he typically has little other difficulty in communicating. I attempted the same topic with this man. Much of the answers were as expected. He spoke about football and his favourite team, but the structure of the Talking Mats encouraged him to open up about some of the smaller details that until now he hadn’t felt the need to disclose. In the most recent example I was asked to take part in a colleague’s Talking Mat video for her training. She is one of our newest members of staff and although we have already developed a good working relationship the activity allowed her more insight to the nature and history of her co-worker. For my experience, as someone who can struggle with sensory stimulation, it allowed me to express some of my needs and obscure preferences (around the office and in general) in a safe environment where I felt able to communicate what would normally be very personal information. And to have someone listen and thoughtfully consider this was a rewarding experience too. As a service, new to the Talking Mats system, we are just scratching the surface of how we can best implement this into our roles, but the possibilities are already multiplying at a rapid pace, almost as much as the benefits we are seeing. This entry was posted in Blog, Communication difficulties, Dementia, Participation, Training and tagged AAC, Communication difficulties, Dementia, Participation, Personalisation, Talking Mats, Training on August 27, 2015 by Joan Murphy. 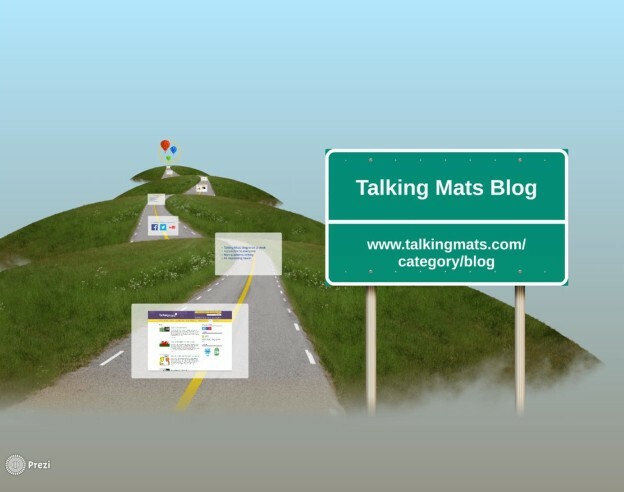 This post is about the importance of the Talking Mats blog and how it can be used as a rich resource of information for anyone interested in communication. One of the first ‘tasks’ that I was asked to do after starting my new job at Talking Mats was to create and give a presentation to an international audience of trainees at our most recent course for Accredited Trainers. I had only been in post for 2 weeks and I was also a trainee on the course, so the pressure was on! The main aims of the presentation was to promote the Talking Mats Blog as a source of rich information which is accessible to anyone, that Accredited Trainers can use it in their own training courses, and also to encourage Accredited Trainers to write their own blog posts to describe how they use Talking Mats in their working and personal lives. I wanted to try and make the presentation look a bit more dynamic than the usual ‘death by PowerPoint’ that can sometimes occur after a whole day of looking at slides! I decided to use Prezi, “a cloud-based presentation software and storytelling tool for presenting ideas on a virtual canvas”, as I’d had good feedback about it when I had used it in the past and thought this would be a perfect opportunity to roll it out again. You can see the completed presentation here. When the day came to give the presentation, I wasn’t feeling on top form after having flu for a few days previously. Because of this my memories of it are rather hazy (which isn’t good for the purposes of writing a blog about the presentation!) but from what I’ve heard, apart from looking ill, I managed to get my points across without confusing (or frightening) the audience! It was a fantastic opportunity to take part in the Accredited Training course and to hear the stories of all the trainees who are dedicated to using Talking Mats to improve the lives of the people they help on a daily basis. I’ve also just found out that the team at Talking Mats have been blogging for 4 years, so get reading! This entry was posted in Blog, Event, Training and tagged AAC, Accredited training, Talking Mats, Training on August 14, 2015 by Ed Blackburn. The measure has been tested with service users from different user groups and there are a number of different versions available, including an easy-read version. Many people with who have communication difficulties are not able to provide views via interview alone. Talking Mats is a communication tool that can be used with people who have communication difficulties. The mat consists of a set of symbols or pictures that are tailored to the subject you want to talk about. My Care. People will be supported to give their views about whether aspects of their care are going well or not going well. Control over my Care. People will be given tools to think about how much choice they have over different aspects of their care. The second and third mats have options for both basic and more abstract concepts. The TM version of the ASCOT will enable researchers to investigate user views regarding social care outcomes. By using this more inclusive methodology we will be able to engage with these seldom heard groups. The use of symbols in combination with a structured approach will enable us to represent these participants’ own feelings/perspectives in the research, rather than us having to rely on the views of proxies. Researchers at the University of Kent will be piloting the ASCOT Talking Mats with people with dementia and people with intellectual and developmental disabilities (learning disabilities). This entry was posted in Blog, Communication difficulties, Learning disability, Participation, Personalisation and tagged Learning Disability, Participation, Personalisation, Research, Talking Mats on August 6, 2015 by Joan Murphy.